I recently had dinner with a friend who shared with me his disappointment that his son at age 37 was still unmarried and was leading a life contrary to the values with which he had been raised. I told him that his son is still on a journey. It is not yet complete and his son may yet fulfill his hopes and dreams. The important thing was never to give up for the future is unknown. Past mistakes don’t always predict tomorrow’s consequences. 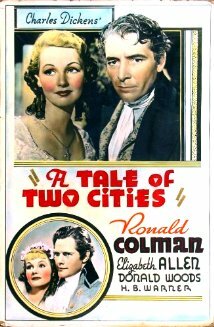 A Tale of Two Cities is a story of one man’s personal redemption from sinner to saint. The Talmud tractate of Avodah Zarah (10b) observes that there are people who can earn their portion in Olam Haba, the world-to-come, in one hour, suggesting that an entire life of sin can be overcome by repenting in the final moments of one’s life. This basically is the narrative arc of the life of Sidney Carton, the hero of A Tale of Two Cities. The film opens on the eve of the French Revolution when Lucy Manette travels to France from England to rescue her aging father, who has been a prisoner in the Bastille for many years. During the trip, she meets Charles Darney, a French aristocrat, who is sympathetic to the plight of the downtrodden French citizens. Charles, however, is the nephew of the Marquis de St. Evremonde, an aristocrat with little regard for the wellbeing of the poor. Aware of Charles’ favorable view of the poor, the Marquis frames his nephew for treason, recognizing that Charles is a potential danger to the French aristocratic establishment because of his heretical views. The case against Darney fails, however, because of the clever defense of Sydney Carton, an attorney who drinks to excess and has led a dissolute life. When Lucie thanks Carton for his efforts, he falls in love with her; however, he inwardly understands that her love for Darney transcends any emotional attachment to him. After Darney and Lucie marry, move to England, and have a daughter, Sydney continues to remain a loyal friend of the family. A crisis arises when Darney is tricked into returning to France during the Reign of Terror in order to defend a friend who has been unjustly accused of sympathy for the now deposed aristocracy. In a trial full of passion and anger but bereft of logic, he is sentenced to death by guillotine because of his familial connection to the Evremondes, who are symbols of tyranny. Carton understands the danger and devises a plan to save Darnay from the guillotine. The plan hinges on Carton switching places with Darnay, who is incarcerated in prison awaiting execution. It becomes clear that Carton is willing to sacrifice himself to save those he loves. Carton’s final words reflect his changed worldview. For him, life is no longer a journey, but rather a destination. He has said farewell to his wasted past and enters the next world personally redeemed. In some ways, the last moments of his life parallel the story of Samson, the judge who, although basically a good man, led a licentious life. Recognizing his faults, Samson decides at the end of his life to sacrifice himself so that others can survive. Sidney Carton’s final moments follow this example of repentance.